Home near Gondola & Bus, Hot Tub, Garage, Pets OK, DISOUNTED NEW YEARS EVE WEEK! “Alpenhill' is a cherished family retreat on spacious private grounds (.75 acre) with a great hot tub, garage and big fenced yard. We're right on the main ski mountain and Free Bus route too, so walking distance or a few minutes drive to the gondola or most services. We boast a very private setting in a beautiful mountain neighborhood with spectacular views all around! It's simply where most want to be when visiting Steamboat and because we’re on one level, no one needs to be left behind. We have a "cabin-like" interior made for casual living but with all the modern high tech conveniences. 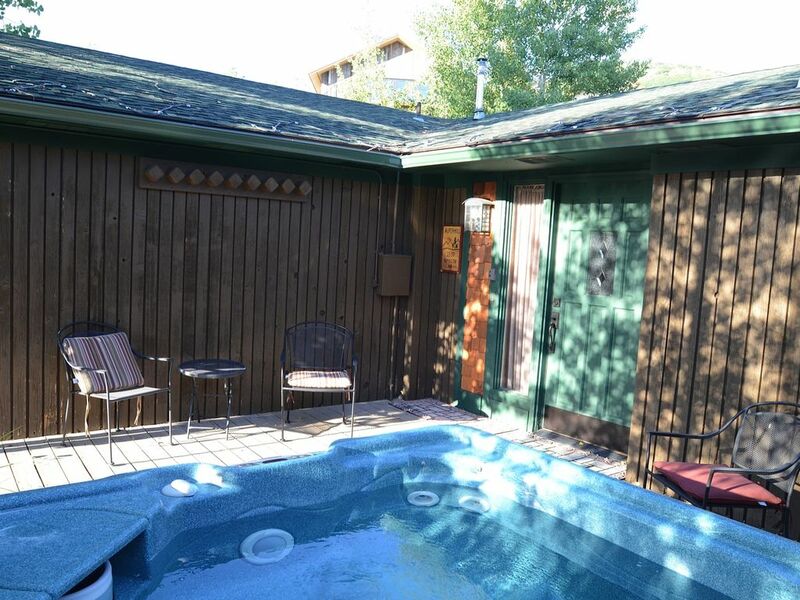 Soak in our private hot tub while the kids and family dog romp in the BIG fenced yard or barbecue and dine on the aspen shaded back deck, then watch the “alpenglow” move across Mt Werner. Walk to the ski slopes, village restaurants and summer music programs. Basic services are close by, as groceries, banks, ATMs, liquor stores, restaurants, medical care, pharmacies and postal services. Well mannered pets are welcome but must be approved. Please tell us about them in your inquiry (breed, age, if neutered, training). Inside you'll find a cabin-like interior with pine walls, a wood burning fireplace and stone hearth PLUS high speed internet, DVD, VCR, HD/TV with DVR, and a family friendly video library for your use. A big oak dining table (expandable) provides a perfect place to gather around for even larger groups. Plus our bar seats 3 and two outside decks are near by. All rooms have good ventilation, ceiling fans and individual thermostats for comfortable stays in any season PLUS Air Conditioning for unusual warm summer afternoons. The laundry room and garage come in handy on active vacations. Our kitchen is well equipped for stylish and memorable meals... inside or outside. This is not just a rental unit, but a real home with many extra comforts and lots of 'Western flair' like log beds and local wildlife photography. In fact, it looks like it may be the home of animal lovers and adventurers ... and IT IS! Bedrooms have quality mattresses and bedding including winter "down duves" and summer comforters, shaded windows and quiet ceiling fans to make for good sleeping, summer or winter. The master bedroom has a beautiful log king bed, and glass doors facing the top of Mt Werner and opens on to the back deck & yard. WHAT a way to wake up!! The attached master bath includes a large jetted tub and separate shower. A second bedroom has another log bed (queen) and a third bedroom has twin beds and is also nicely decorated. Need assistance during your stay? Caretakers live in an apartment on the property, completely seperate with their own private entrance, but are close by so can easily provide help if needed. They care for the grounds in summer and snow removal in winter, otherwise you probably will not see them. "Alpenhill' was made for good times, so just bring your loved ones (4 and 2 legged), your skis and a smile and come ready to make your own memories. The owner, a designer and wildlife and animal lover and avid skier, moved 'Out West', years ago and then discovered Steamboat for her family's second home. 'Alpenhill' was selected due to it's prime location with private grounds, so family dogs could come along. The original large single family home was remodeled to include a separate caretaker's apartment to ensure on site care year round. We have a unique feature of being on the main ski mountain, but with a relatively flat lot and a large fenced yard, perfect for kids and dogs. We welcome well mannered pets. All bedding, bed linens, pillows, kitchen and bath towels are supplied. We provide many spices / herbs, coffee filters, personal soaps, some condiments and paper products like paper towels, tissues and TP to get you started. Set a nice table for special dinners! Dining table will seat 6-8 w/ added table leaf + 3 at bar. In summer charcoal BBQ is on back deck w/ patio table to seat 6-8 as well. Includes large fenced private yard and is "dog friendly." Back deck, near kitchen, gets morning sun and is shaded by aspen trees in the afternoon. In summer patio furniture & BBQ are provided. Only 3 steps on to entry deck,then all on one level. Grab bars in both bathrooms and good railings at deck stairs. AC too!! Private hot tub with therapeutic jets. On "FREE SKI BUS" route which services the ski mountain, downtown and all around the Yampa Valley. AC supplied during summer. The home was as described, nice layout, we had a great time. thanks for having us. Great house close to bus stop with hot tub! Thank you for a comfortable stay in Steamboat! Everything was just as described and it made for a perfect trip for our whole family including our 4 legged friend. Cynthia's place was amazingly perfect! We have been coming to Steamboat for the past 5 years and this was by far the best place we have stayed. The backyard was perfect for our pup to run around in and play in the chest deep snow! She loved it! The hot tub was wonderful after a long day skiing and super private which we enjoyed. The decor in my opinion is what I think of that a mountain town home should be. It was cute, cozy and mountainesque. The fireplace was great and easy to use. The bed we slept in was so extremely comfortable. Super dark and quiet in the mornings which is how I need it to be! The bus stop wasn't too far away and so easy to get to and from the mountain and in to town. Very user friendly. Check in was a breeze as a code is given. We didn't use the garage as we parked just right outside the front door. The kitchen was well stocked and had everything we needed for a few meals in. Overall Alpenhill exceeded our expectations and we will definitely be looking out to stay here again! Warm cozy home away from home. Location was wonderful. Close to town and the cute shopping area. The owner was available by phone, and had a care taker next door. We had plenty of linens, towels, and the kitchen was well equipped. Great fenced in yard for the dogs. Nice view of the mountains. We had 6 people and 2 dogs and we were very comfortable. Location was also convenient to hiking trails, hot springs, and of course skiing. It was wonderful to take a break with a soak in the hot tub after an active fill day. The owner certainly made a welcoming place to stay , and I would recommend this home and would stay again. We loved it, and had a great time. Very comfortable property and quiet location. Also enjoy being able to include our pet on vacation and it's the ideal property for that. Cynthia made sure to check in and verify all is ok. On site care taker was there early to shovel deck and check in too. Property was clean with a well supplied kitchen! This home was perfect for 6 of us. Private deck we enjoyed in the afternoons. Closely located to stores and the main road. Would stay here again!! Owner & caretaker were very helpful and kind. Pets must be approved by owner and are mostly welcome except during "Mud Season" of April and May. Please provide owner info one each pet (age, breed, size and if neutered) and to confirm pet charges. No dogs in "heat" are allowed on the property. For groups larger than 6, prices may vary slightly. Cleaning fee is additional and for stays under 4 weeks. Monthly rentals are available, by special quote.